The small island of Mauritius remained uninhabited by man for thousands of years, apparently because the island is in the middle of the large Indian Ocean, and was not on a major sea route. According to history, around 1000 AD Arabs were sailing and trading along the African coast as far south as Mozambique and the Comoros Islands, and they probably called on Mauritius, although there is no mention of it on their early maps. The Portuguese rounded the Cape of Good Hope in 1488, and thus became the first recorded Europeans to sail into the Indian Ocean. The Dutch eventually decided to settle in Mauritius in 1634, and they built a fort near to the place where they had originally landed. Forests were destroyed in order to make way for imported crops such as sugar cane, rice, tobacco, indigo, vegetables and citrus trees, which were planted at the base of the mountains. The human population of Mauritius increased drastically -sailors, invalids, convicts and slaves came to settle on the island. The latter thus had to find some food sources inland itself in order to feed themselves. This is how the fauna and flora of the island deteriorated including also the Dodo. The Dodo were huge birds of unknown species that existed only on the island of Mauritius. It is now known that the Dodo is a distant family member of the Asian pigeons. 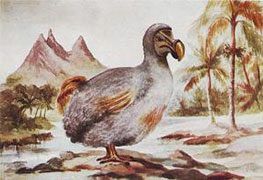 The Dodos stood up to 1 metre tall and weighed in at approximately 20Kg and inhabited the Island of Mauritius for millions of year evolving to a bird that had adapted to live on an island isolated from humans. The bird was bulky, slow with short wings that prevented it to from flying. According to records and pictures of the Dodo, it is believed that it was plump with soft grey feathers, slightly white on the tail. It had short and stubby yellow legs with four toes at the end. Its head was apparently light grey, and it had a crooked beak. Thus, described as being a plump bird, it was an easy prey to predators and its meat was described as being delicious- which speeded up its extinction. Due to its short wings and bulky body the dodo could not fly or flee in the face of danger and as such the Dodo was a very easy prey. The Dodo birds had no experience of any types of predators before the arrival of settlers in the island. They were passive creatures even when approached by human visitors for the first time. So it was with lack of fears and child-like innocence that those birds greeted the first settlers, the Dutch, in 1598. Its consumption became common and most appreciated by those living on the island. However, humans were not the only predators. Rats and monkeys escaped from ships and posed a threat to Dodo eggs and chicks. Deer, pigs, goats, chickens, dogs and cats were all introduced to the island, each making the once “peaceful and easy” life of the Dodo a real struggle. Slowly, the sanctuary that had sheltered the Dodo for millions of years was being destroyed, and the Dodo was getting rarer. 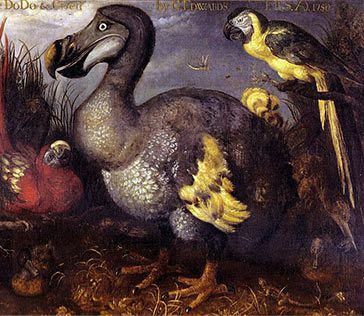 The last claimed sighting of a Dodo was reported in the hunting records of Isaac Johannes Lamotius in 1688. Statistical analysis of these records by Roberts and Solow gives a new estimated extinction date of 1693. Even though the rareness of the Dodo was reported already in the 17th century, its extinction was not recognised until the 19th century. 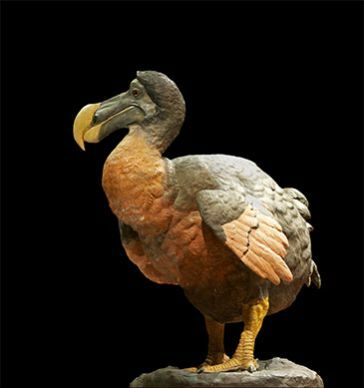 This was partly because, for religious reasons, extinction was not believed possible, and partly because many scientists doubted that the Dodo had ever existed. It seemed altogether too strange a creature, and many believed it a myth. According to the Encarta Dictionary and Chambers Dictionary of Etymology, "dodo" derives from Portuguese doudo (currently doido) meaning "fool" or "crazy. Grey in color, the dodo bird may have been a relative of the pigeon family. Museums all over the World have skeletons of Dodos but no museum, not even ones in Mauritius have a skeleton from a single Dodo. The British museum had a complete specimen in their collection up until the 18th century that was actually mummified (including skin etc). In Mauritius, a right turn from the Government House in Port Louis will bring you to the Dodo museum (Mauritius Institute), where old sketches and skeletons of the legendary bird are showcased. From 2nd June to 4th July 2006, a group of British, Dutch, and local researchers lead a dig at a swamp located south-west of the island in Mare aux Songes in the hope of discovering remains of the Dodo for the purpose of better understanding the Dodo's behaviour in an undisturbed environment. This systematic excavation followed successful prospecting a year earlier were they uncovered about 700+ Dodo bones (of both adult and baby Dodo bird). Who knows that one day scientist may find a complete DNA sequence and future developments of science lead to a producing a live Dodo as theoreticised in the film directed by Steven Spielberg, Jurassic Park. 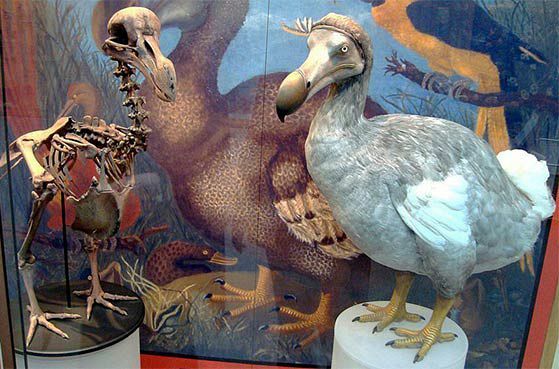 The Dodo has become an archetype for extinct creatures, it featured in the novel 'Alice Adventures in Wonder Land' by Lewis Carroll who was inspired on viewing the skull and claw at the Oxford University Museum, and to this day these bones can be seem there.